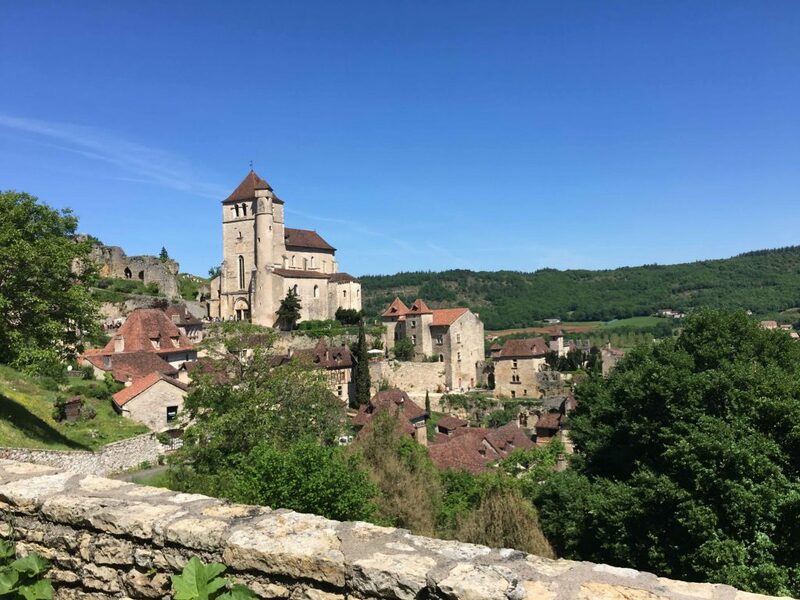 After loosening your neck muscles to constantly be looking right, and learning to live without the clear confidence of a green light, you’ll be ready to peel back the history of the French countryside. Karen and I mapped out a clockwise lasso of sorts around the country, trying not to get sucked back into the ever-present epicenter that is Paris. 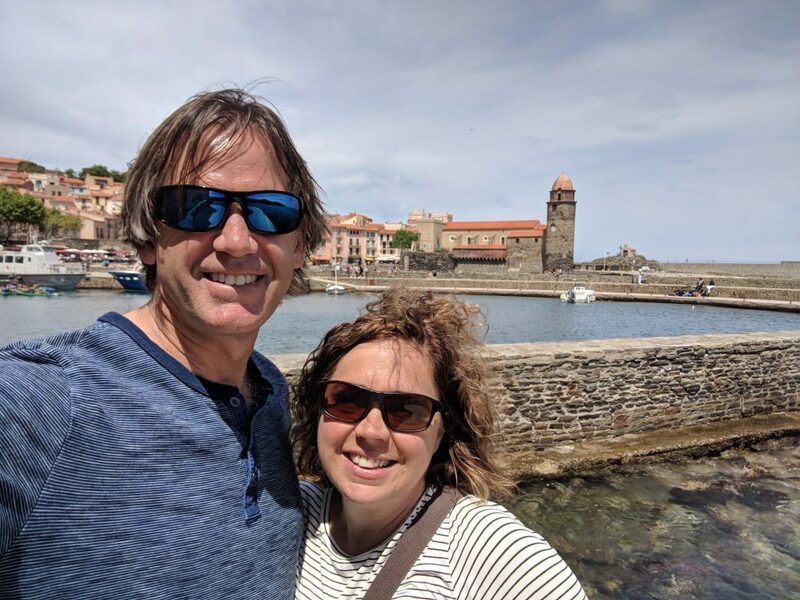 We catapulted ourselves out of The City of Lights by way of a 9 hour drive directly south to the Languedoc-Roussillon region, butting up against the Pyrenees and the Spanish border. In the sleepy beach resort town of Canet-en-Roussillon was a brand-spanking new Jeanneau Sun Odyssey 440 with our name on the invoice. It was high time that we see this new lady of the sea, and make sure work was progressing on her commissioning. Buying a new boat is different than a new car; you don’t just show up at the dealer, negotiate your price, and drive home with your new wheels that day. Instead, a new boat is shipped partly disassembled from the factory – in our case from Les Herbiers, in the countryside west of Paris. A boatyard is selected to receive the new boat and to put all of its bits and pieces together – the ‘commissioning’ – and make sure everything works as intended. We bought our boat through a broker/friend in upstate New York, Steve McPherson, from Navy Point Yacht Sales. Steve is a Jeanneau dealer and sells a lot of them to hearty sailors on Lake Ontario. We were a bit of an exception for him by taking delivery in France, although one other customer of his recently did the exact same thing. He selected the boatyard in Canet-en-Roussillon named Sailing Atlantic Services, a company that does lots of Jeanneau commissioning for boats destined for the Med. And we paid a visit to SAS to make sure everything was moving along on schedule. In addition to the regular commission work of the boat, we had hired SAS to do several other projects to fit the boat out the way we wanted for long-term cruising. To our delight, we got to view the boat in the water, and the good folks at SAS were moving along well on the punch list of items. 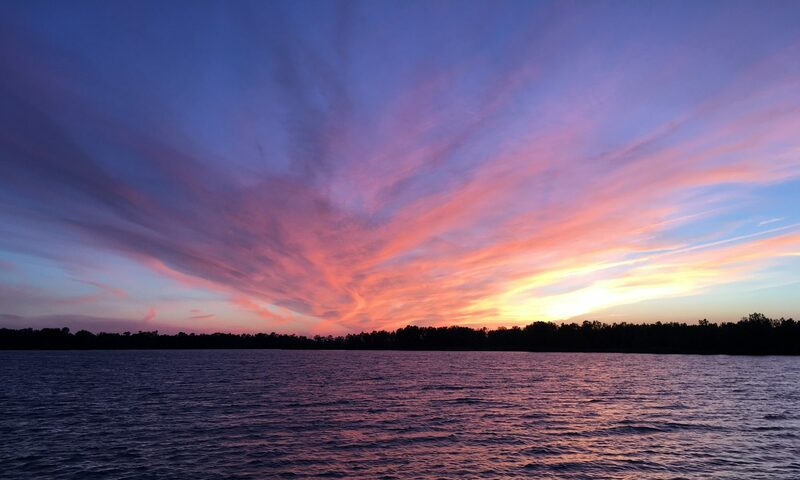 Some of the bigger projects – mounting the bimini and the solar panels, mounting the dinghy davits, and installing extra electronics – were nearly complete. With confidence in hand, it was time to hit the road for two weeks and figure out what else the French can do besides build fine sailing machines. Canet-en-Roussillon is in a region in southern France called the Languedoc-Roussillon, famous among other things for their white wines. 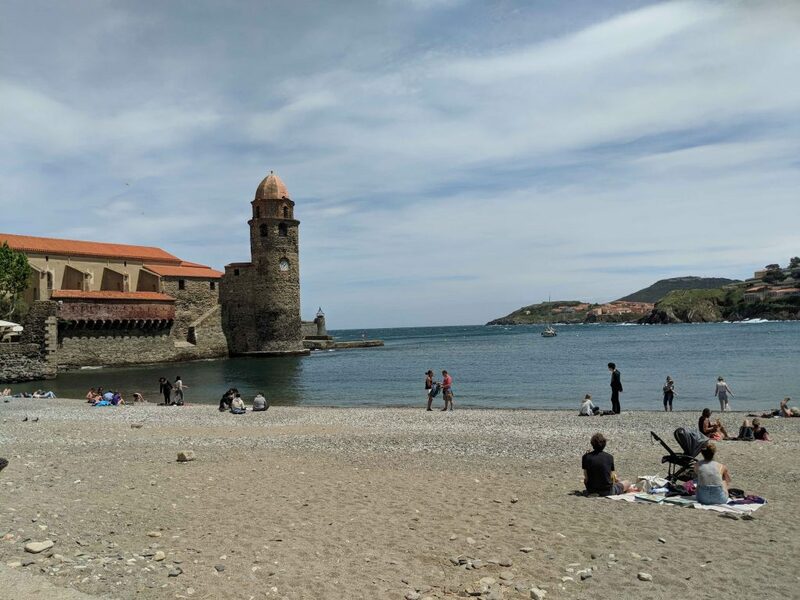 Our own Tour-de-France was going to take us through many wine growing regions, so we opted instead to venture south to a coastal hamlet in the shadows of the Spanish border named Collioure. This could be a potential stop on our first day underway with Sea Rose, and it got good reviews from the Rick Steves European tour guide enterprise. The sun broke out and welcomed our arrived, as did the charming narrow streets and waterfront cafe dining. 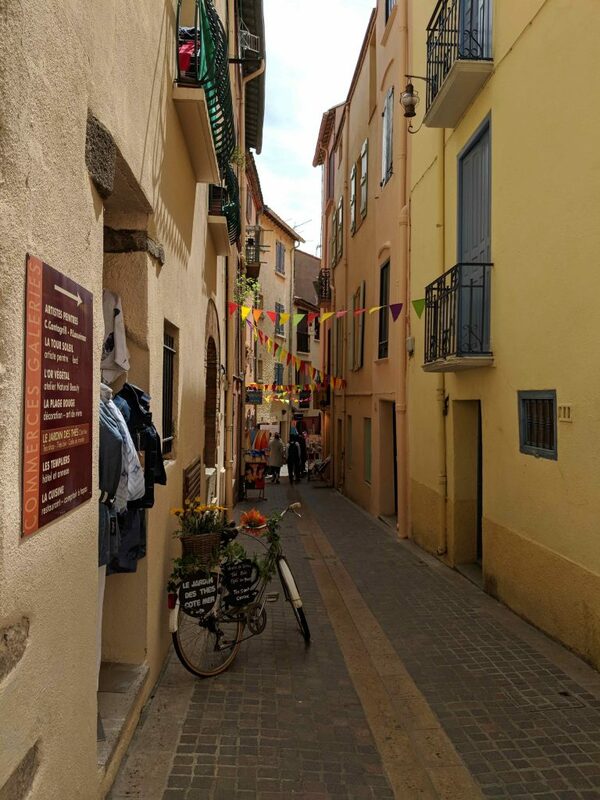 Karen and I had taken turns researching the many cultural sites in the French countryside and came up with a clockwise circuit to see as much as we could during the two weeks. We had a rough plan and a few hotel reservations, but left some wiggle room for changes. Two weeks seemed like an ample amount of time, given that in our prior life we had previously tried to squeeze vacations into just one week. We felt we could see most of France, except for the Bourdeaux and southern coast along the Atlantic. 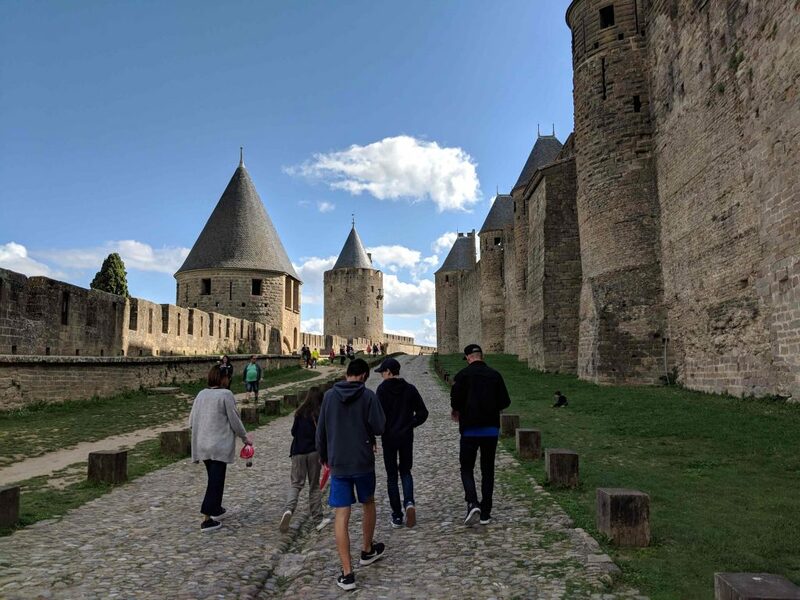 As we turned north and west, we headed to Carcassonne. The main attraction is the medieval center, consisting of a 13th century collection of towers, turrets, and walled-in-village. As the story goes, the city got its name while besieged by Charlemagne for several years, where upon a one Madame Carcas saved the town by throwing a fat pig over the wall despite the fact the village was on its last scraps of food. The offenders decided they would never win and gave up the siege. Today it is known for its siege of tourists, and curiously, unlike many other castles and medieval settlements which are protected from development, this one is full of hotels, cafes and restaurants within the medieval walls. 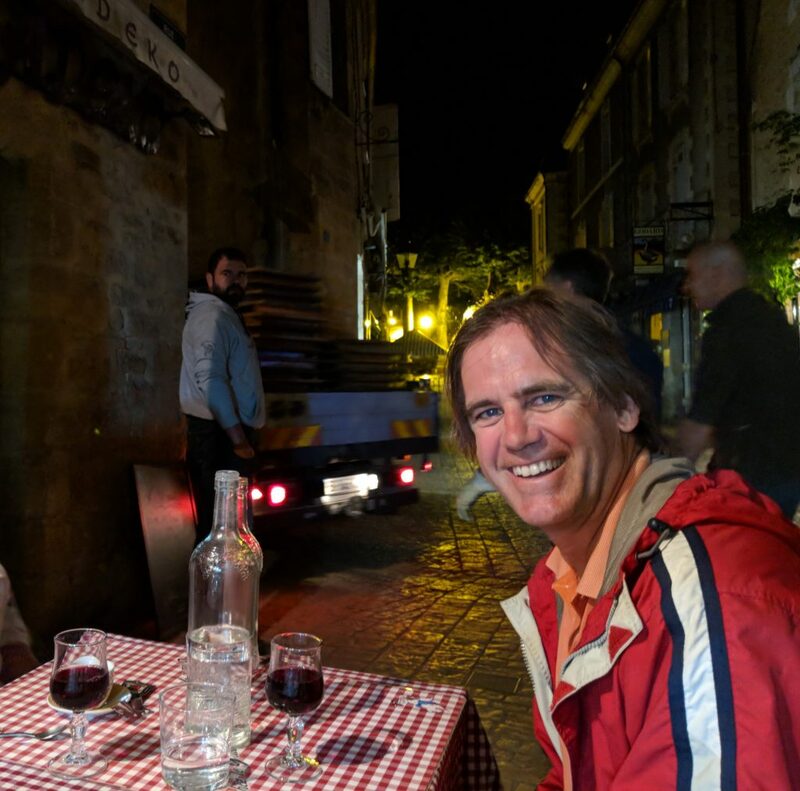 At first I was turned off by this approach, but we both came to love the ability to sit inside a well restored medieval city center and enjoy a cold beer and tasty pizza. We started to learn that pizza in France is unlike anywhere else. First of all, in french style, it is full of what must be super fresh ingredients, as the taste is incredible. I make a pretty fine pizza back at home on the barbecue, so I’m no neophyte. The second interesting fact is that they serve pizza in sizes that are large for one, but barely enough to share with two. Most people I saw ordered one for themselves… and the conundrum on how the French stay so skinny continues. Lastly, they serve the pizza whole, without being sliced. When I first received mine, I thought perhaps the chef just forget to slice mine, but, no, this is de rigueur in France. You cut up bite-sized pieces on your own, including crust or skipping it as you wish. But if you want real adventure, ditch the pizza and try the steak tartare. Raw hamburger meat, although much better quality than McDonalds, with a raw egg on top. Vive la France! 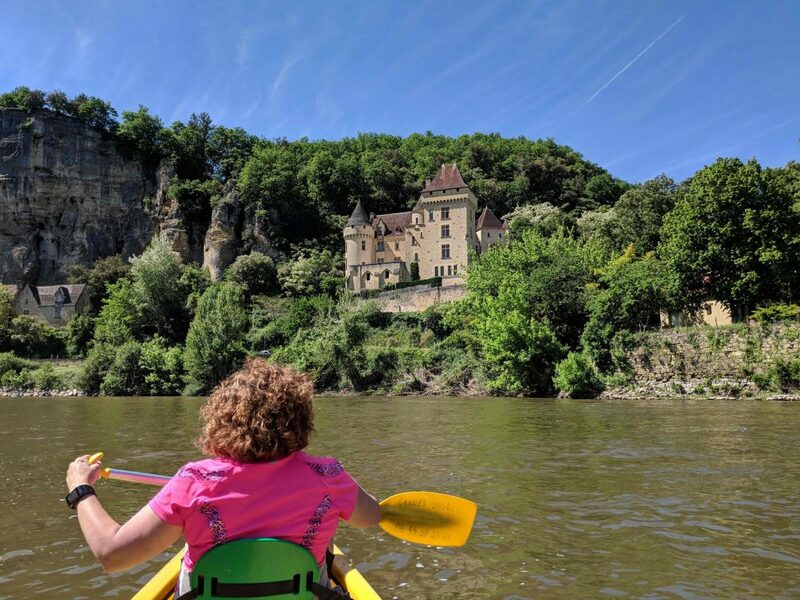 With our stomaches over-extended, we headed onward to the Dordogne region, where we had an appointment with a canoe on the Dordogne river, near Sarlat. Along the route, we planned to stop at St-Cirq Lapopie, a village shown in travel photos as clinging to a hillside. Well, rental car drivers of France be forewarned. Along the A20, and most other autoroutes (e.g. 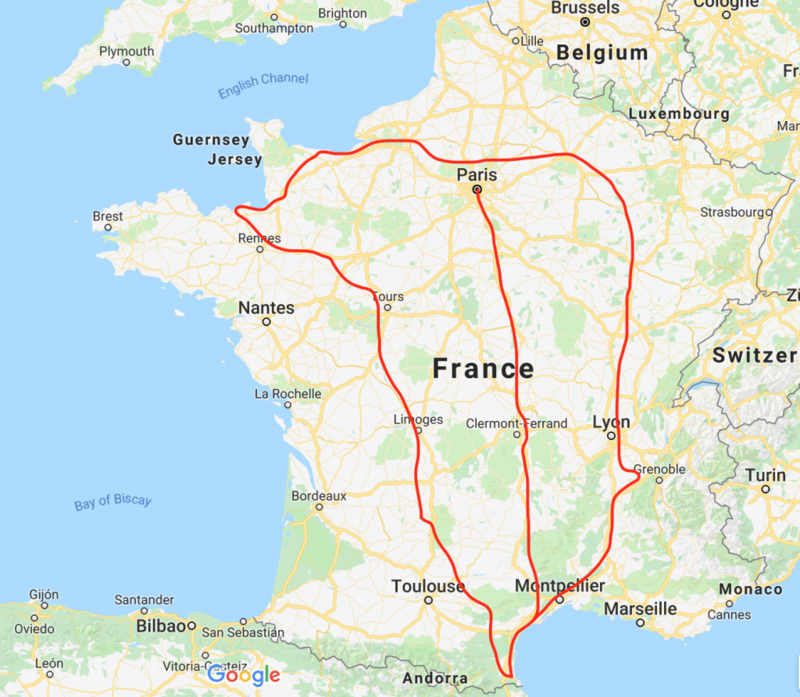 interstate highways) in France, if you don’t pay close attention to your Google Maps instructions and you miss the exit, it can be a long time before the next exit appears! You can drive for 20-30 minutes before you see another one. When we missed the St-Cirq Lapopie exit, the sentiment in the car was that of abject silence, as words spoken might have caused remorse later. We managed through this driving crisis by following Google’s direction through very remote countryside villages back to St-Cirq Lapopie. The French enjoy their place names for any town, regardless of how small. We passed countless ‘towns’ with their own proud signage, even though they consisted of just 4-5 houses. For all I could tell, they could all be of the same family. St-Cirq Lapopie met the expectation exactly, and we met our step count goal quickly with a walk and lunch. It was nice to see these places before the regular summer season got underway, because you can tell they were setup for a large influx of cars and buses, with seven public parking lots terraced up the hillside, complete with signage on how many spaces were left in each one. 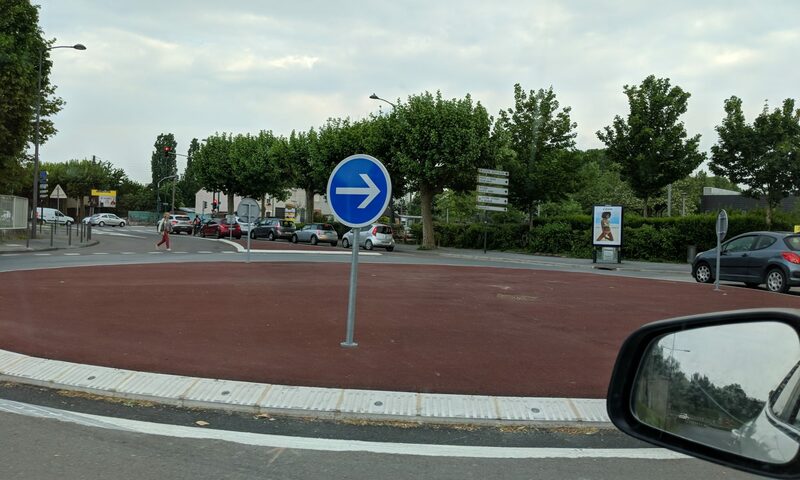 The French definitely do a good job of labelling where and how many parking spots are available in their towns. Back on the road, and slightly off our prescribed time line, we pushed on to Sarlat. This region is famous for its caves, including one from the Cro-Magnon era. I faintly remember something in grade school history class about the Cro-Magnon, but that was before I started enjoying history. Alas, the blonde girl across the classroom from the high school tennis team was far more intriguing. But I digress. 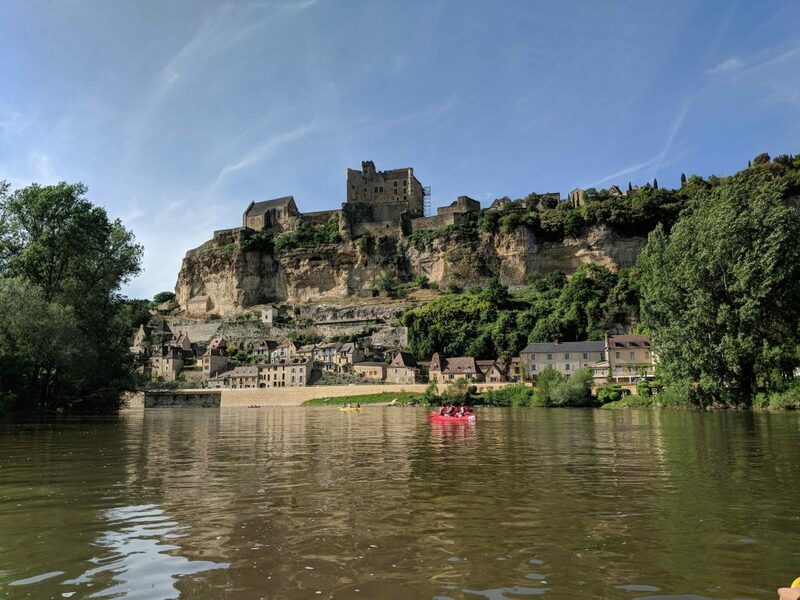 With paddles in hand, we started our canoe trip down the river, taking in cliffy banks, which transitioned into impressive vistas in the shadows of castles. It was nice to ditch the car for a few hours and drift back to a time in medieval history you don’t get anywhere close to in America. 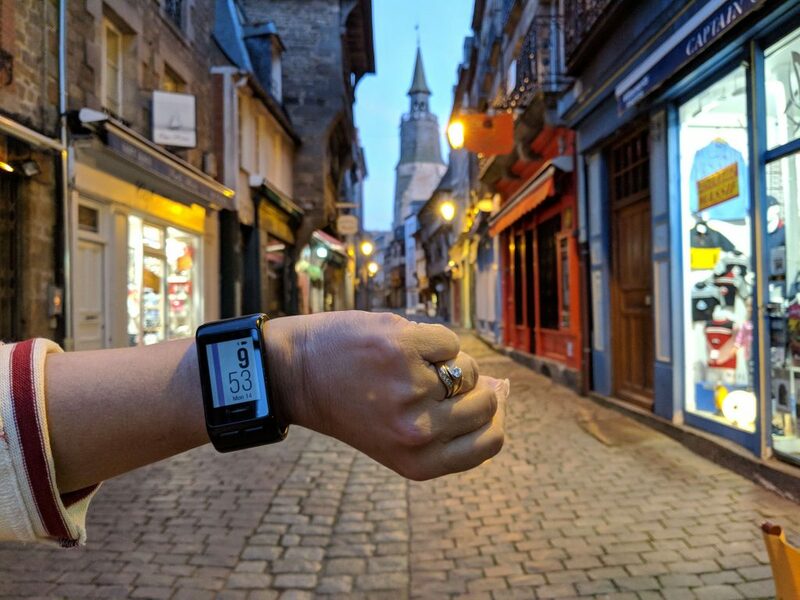 The designers of Sarlat loaded on the charm for us travelers, with narrow streets, cool evening lighting, and cozy cafes spilling out into the streets. We followed in Rick Steve’s footsteps to his cafe recommendation, where we sat down next to another American couple toting their own Rick Steve’s France book. Hmm, so much for mingling with the locals, but it was nice to have a chat with English speakers. It ended up that they were boaters as well, so it was easy to pass the hours away. I’m not sure if the cafe owners are to blame for spilling into the streets, or the French drivers are to blame for forcing their cars and delivery trucks onto alleys more appropriated sized for a wheelbarrow, but it is impressive to observe their boldness, particularly as we experienced, when you have to move your chair out of the way to not be run down by wheels or whacked by side mirrors. No waste of asphalt around here! 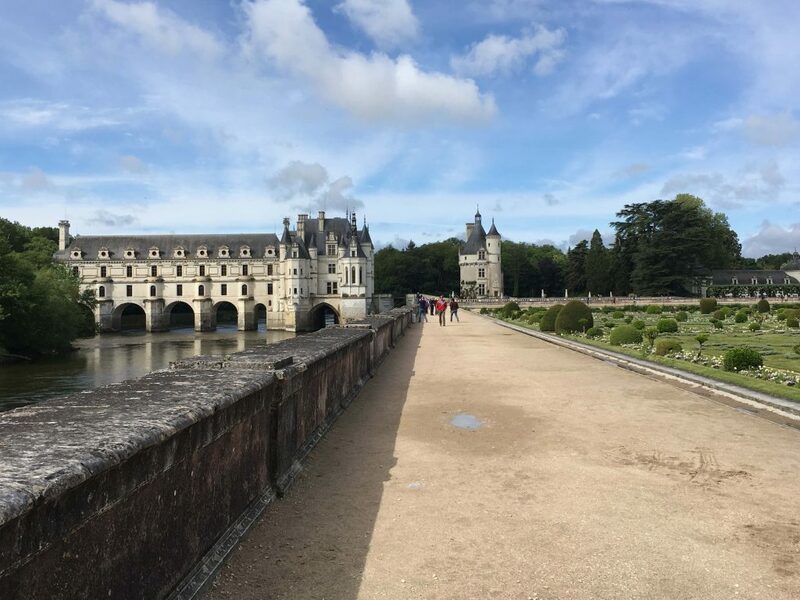 By now, we were getting an up-close-and-personal experience with French food (dare I say ‘cuisine’), and it was time to push on to the Loire Valley, where food, wine and chateaux awaited us. To be clear, this is the French version of a chateau, meaning castle, not a fancy Napa Valley winery in a tan-stucco facade built 20 years ago. Nope, this was the real thing. The Loire Valley is considered chateau country, with over a thousand castles and palaces, many open to the public. Apparently, the Moors pushed into this region from Morocco and started building these fortresses. Later, during the Renaissance, wealthy aristocrats, needing a mansion in the country for hunting and bragging rights, took them over. But bragging rights don’t come cheap and the high cost of upkeep drove many of them to be turned over to the government. Financed now by you and me at the turnstile, they are spectator sights to behold. 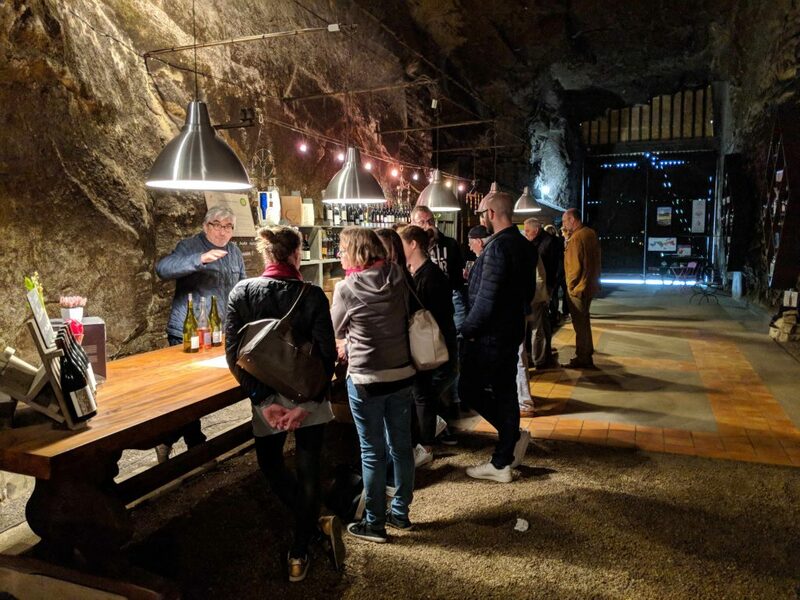 The Loire is also famous for its wines, and we did our small part to help finance this part of the region as well, visiting wine tasting rooms squirreled away deep in caves, some of which were sources of stone to build the castles standing immediately above them. Without a doubt, the wines in France are a delight to try. While there were some presumpituous wineries, by and large, it was a casual, easy-going experience devoid of the fancy talk and hyperbole found elsewhere. But most impressive by any measure is the economy of the experience. Rarely do you have to pay to visit a tasting room, and better yet, you can get great wines for under 15 euros. In the restaurants, frankly, it was cheaper to order a glass of house wine than a beer! We quickly began strategizing storage space in the trunk of our car, knowing that a french sailboat needed to be indoctrinated with a respectful quantity of wine! We ended up staying for two nights in the Chinon area of the Loire. We could have stayed a week or more. Onward and upward, we aimed our Opel SUV to the Brittany area of northern France. We had hoped to stop by the Jeanneau factory along the way, but their tour schedule and our driving route didn’t line up. Brittany is a rugged peninsula with strong Celtic ties and a distinct culture and customs from the rest of France. In 1491, the feisty French King Charles VIII (stay awake now, don’t gaze over to the tennis hottie across the classroom) forced Brittany’s 14-year-old Duchess Anne (you go girl!) to marry him (sigh), leading to the loss of independence of this region. In the fallout, Brittany was given certain freedoms, including the ability to keep their roads toll-free, which continues to this day. 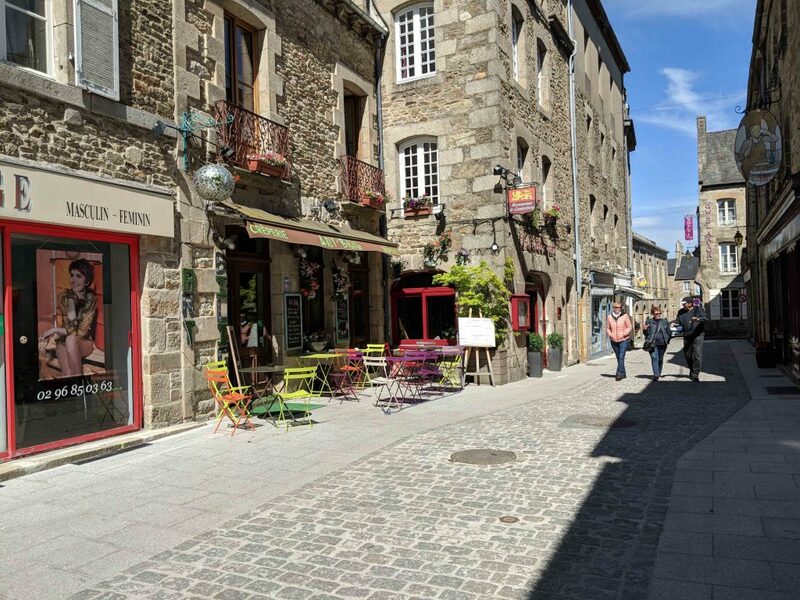 We took our new toll-free windfall, and spent it in Dinan, and later that day in St-Malo. Dinan is unique in that its town center is on top of a high river bank, with a charming (though steep) cobble-stone walk down to the river’s edge, with, you guessed it, more cafes and restaurants. Still light out at 10pm! Just down river from Dinan, where the river meets the sea, is the more famous city of St-Malo, having attributed its recent attention from the book ‘All The Light We Cannot See’ by Anthony Doerr. Karen had read the book as a part of her book group, and it was on my list to start, but regardless of your baseline, St-Malo, especially the old walled city center, is a sight to behold. We weren’t even sure we had time to visit, but once we drove into town, it was obvious this was a place not to be missed. Inside the walls was an elegant center giving away to swanky stores, cafes, and hotels. It seems the Brittany folk like their blue and white striped attire, or maybe that’s what the tourists demand. The nautical theme is immensely appropriate, with striking vistas over the English Channel from the ramparts. Part and parcel of the attraction is the 40 foot tides that make the coastal view ever-changing. We had thought that the Bay of Fundy tides were unique. They have competition in St-Malo. The huge tide swing leads to all kinds of interesting engineering ideas. There’s a saltwater swimming pool at the beach, with a high diving platform looking starkly isolated at low tide, but barely visible at high tide, where you can dive into what was just the pool and now is the entire sea. Just offshore are two islands that you can walk to at low tide, but come with fierce warnings to head back ashore when the tide turns. 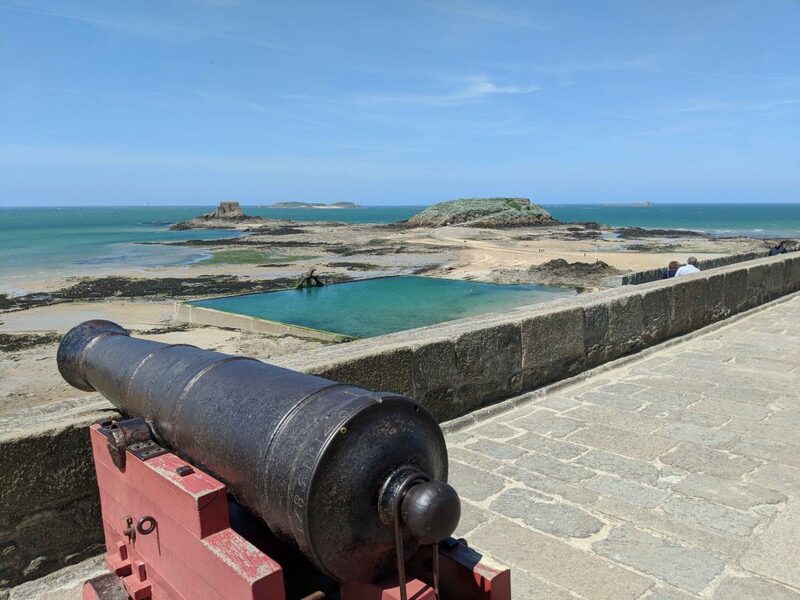 Much of the old St-Malo was hit by Allied bombers, but you wouldn’t notice it today, as it has been beautifully restored and I think would make any old-time St-Malo resident proud. 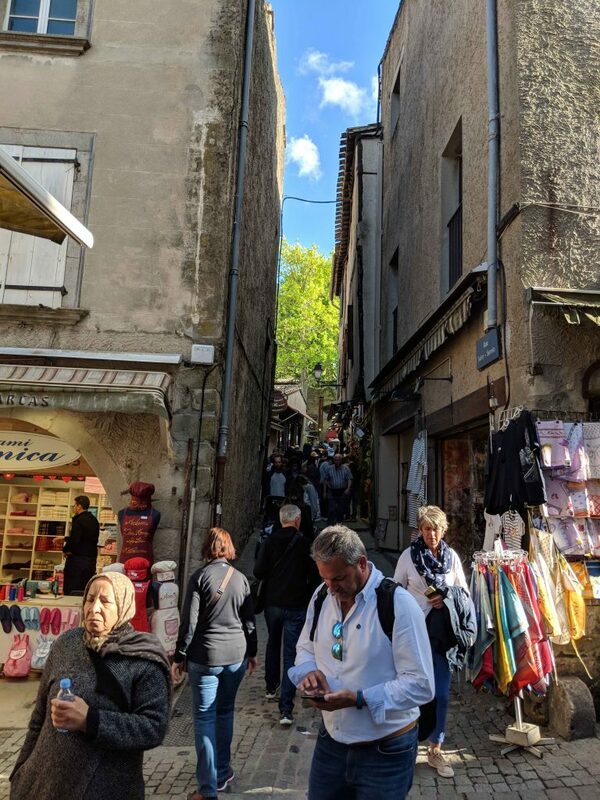 The challenge with France, and I think most sight-seeing travel, is how to balance what becomes an endless list of great places to visit versus a reasonable pace of travel. Karen and I tend to push for more sights and less dawdling and strolling. You never know when you will be back to a place, so we feel it is better to see as much as you can and keep the pace up when you are in the midst of so much beauty and history. In that spirit, we left early the next morning to drive to Normandy, another prominent peninsula jutting out of northern France. 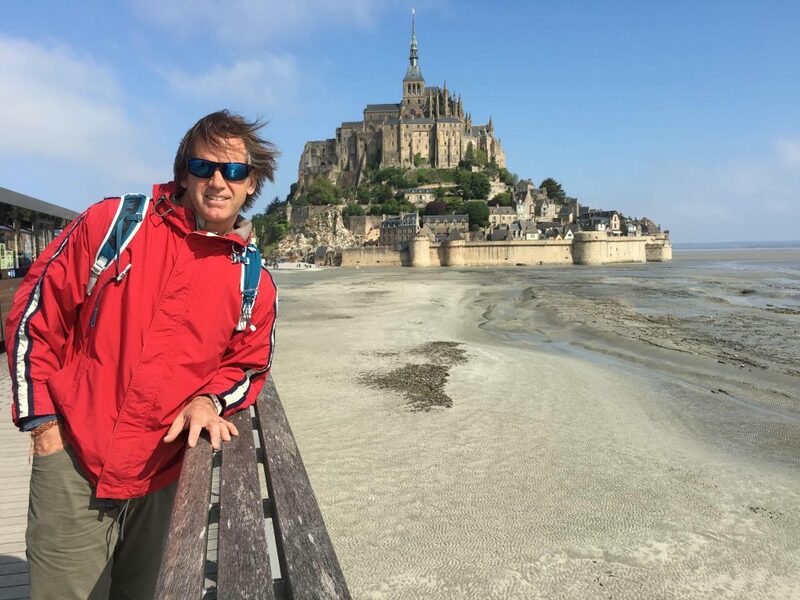 Along the way, we planned our visit to Mont St-Michel carefully. This Benedictine abbey and medieval fortification, rocketing skyward and isolated on an island off the coast, visited by a controlled tourist bus across a narrow causeway, might look familiar to you from postcards and movies. Our buddy Rick Steves warned of crazy crowds mid-day, and honky-tonk retail stores as you exit the bus drop-off. Like any good Rick Steves fan, we heeded his advice, arriving early and turning left at the entrance instead of right where the masses went. The Benedictine monks were a modest lot, creating a pilgrimage site for Christians worldwide, but designing the structure for function, not glamor. We grabbed a couple of self-guided audio tour handsets for the occasion. I always feel a bit like a walking robot using these things, as I listen closely to what the recording is saying, then walking methodically to the next numbered station. Without it, though, you are left to wonder what history you are missing out on. And they allow you to follow along at your own pace rather than using a human guided tour. With the spire of Mont St-Michel in the rearview mirror, we continued north into the heart of Normandy, using the town of Bayeux as our home base. 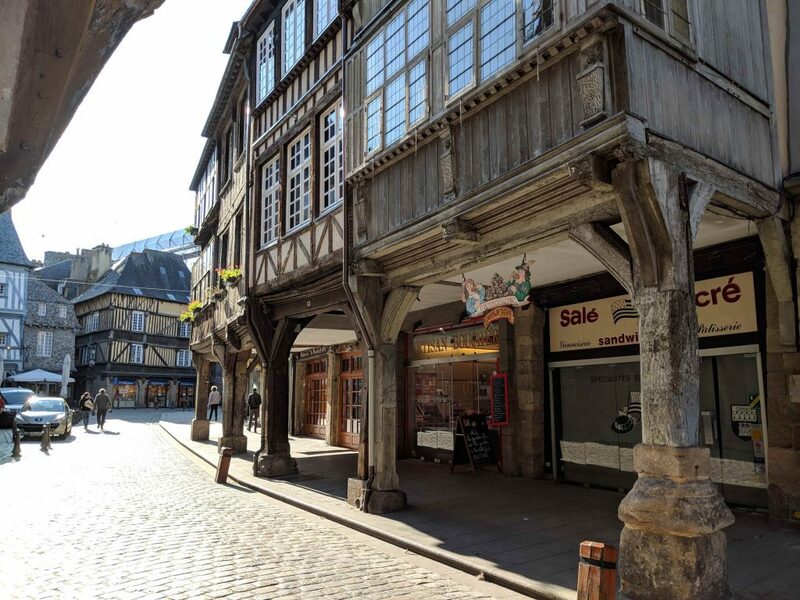 Bayeux has the distinction of not being bombed by the Allies during World War II, owing to a local chaplain who made sure London knew it was neither a strategic location nor home to any Germans. Appropriately, it was the first city to be liberated by the Allies after D-Day, and because it was an intact town, it became a base for the Allied Command to guide the follow push on into Berlin. 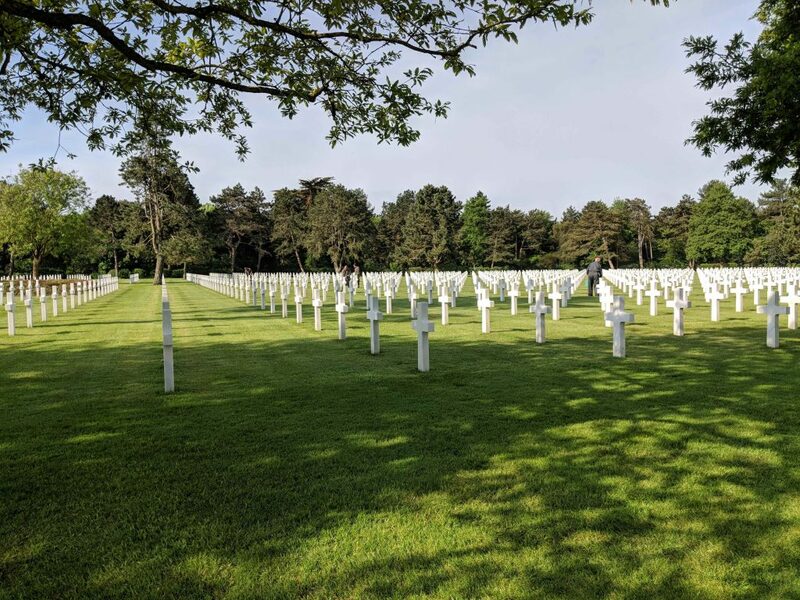 It’s hard to imagine any American coming to France and not yearning to visit Normandy. The emotional pull and the need to pay homage to such a large loss of life but yet a huge strategic success in WWII can’t be understated. I had just finished reading ‘D-Day’ by Stephen Ambrose, and Karen was part way through it. The magnitude of the planning effort, and the scale of the seaborne craft, 7000 in all, is hard to fathom, but when you are standing right at the D-Day beaches, you start to comprehend what was needed to strike a beachhead that was 80km long. 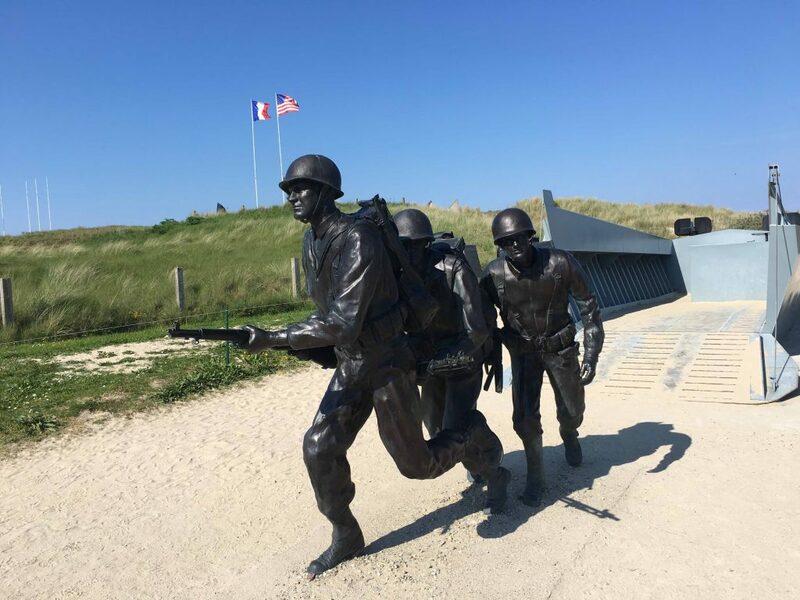 We first headed to Utah Beach, and its expansive Utah Beach Landing Museum. I’ve become a history nut as an adult, needing to read every historical plaque as we walk through cities and national parks. This museum beat me though. After two hours, I was only halfway through, and Karen was politely prodding me to pick up the snail’s pace. To the designers of this museum, I apologize. You’ve done a yeoman’s duty documenting and honoring all aspects of D-Day. If only there was more time. I really wanted to check out Pointe Du Hoc, the legendary site of the Army Rangers ascent of a 30m high vertical cliff face, with what crude implements they managed to retain during a rough beach landing. Germans were firing down at them and cutting their grappling hook lines, but those persistent Rangers prevailed. Timing was everything, as they only had 30 minutes before the monster English Channel tides would overtake them at the beach. At the summit, they discovered the massive 155mm guns had been moved by the Germans, leaving telephone poles in their place as decoys. Later the Allies found them hidden less than a mile inland. 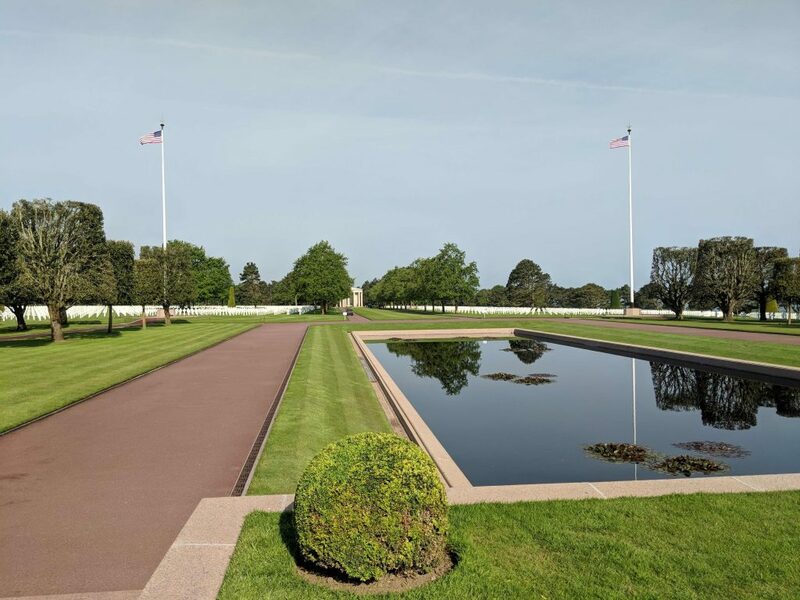 On our second day in the area, we decided to check out the American Cemetery and Memorial. This is the site you see so often in photographs, and that played a prominent role at the beginning and end of the movie, ‘Saving Private Ryan’. The site is built on French soil, but run by the American Battle Monuments Commission. In Grimmett style, we showed up at the cemetery’s adjoining museum just as they were opening the doors for the day. If we had not been to the museum at Utah Beach, this one would have served as a fine replacement. It was a thoughtful mix of written and video media, clearly built by Americans as each plaque had English first and French second! The only distracting experience of the museum was a gaggle of school-aged kids, clearly without interest in history, at least of the D-Day variety, who were talking loud and sitting with their backs to the movies and media. It took some strong will power for this easy-going California not to comment; but, I’m sure I unknowingly showed disrespect of some kind in my youth. With our two days in Normandy over, it was time to turn east, as we continued our ‘roundabout’ of France. We’ll pick up the rest of the story in our next blog post. 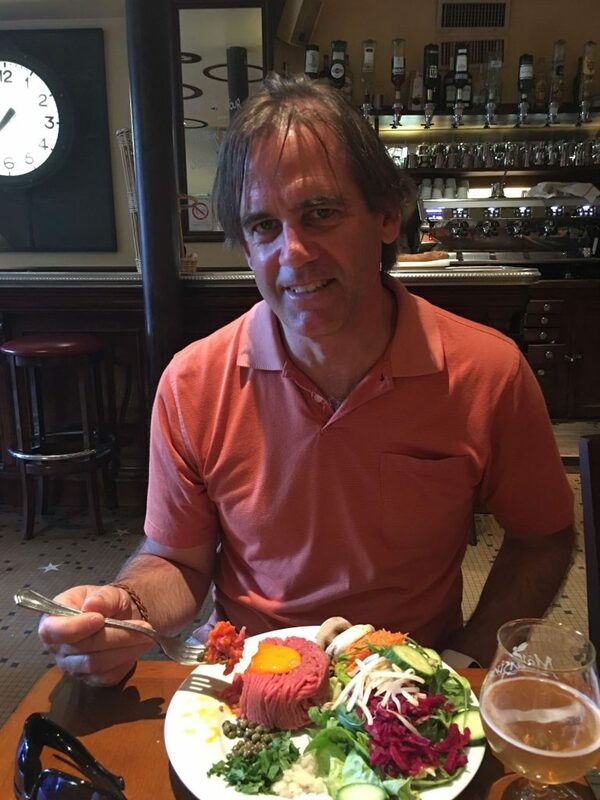 Thanks Pat… if you concentrate real hard on your dining partner and the lovely ambiance of your chosen French cafe, the raw beef topped with a raw egg is not really that bad! I don’t know that I will be repeating it any time soon though! Take care.